Commemorating the 77th Anniversary of Executive Order 9066 which ordered the incarceration of 120,000 Japanese Americans. 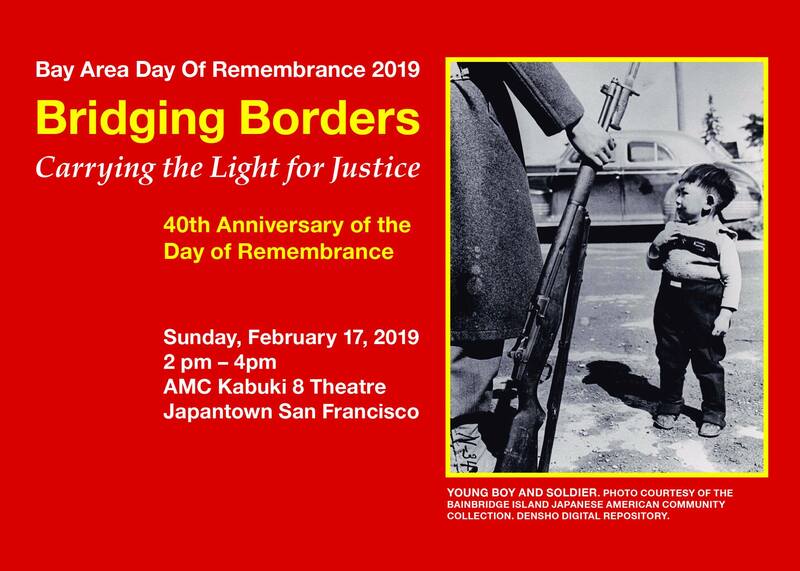 I want to thank the members of the committee today for organizing this 40th Day of Remembrance event here in San Francisco. Today, it is one of dozens taking place all across the country. Today is about us collectively remembering. It is about enriching our collective memory; for we can remember and understand so much more together than we can alone. We know that remembering is an act of defiance and resistance to forces that have tried to get us to forget or remain silent; forces that have tried to sweep it under the rug or told us the past is past. Remembering is an intentional act as part of our own survival we have tried to bury painful memories, humiliation, shame, and degradation. We are as a community learning more each year by uncovering more layers and complexities of our community’s experience (it was never a singular story). Our remembering is healing and liberation, not just for the Japanese American community, but for other communities as well. I come to you as a speaker today, not as a Japanese American, but as an Asian American of Chinese descent. I consider myself a “refugee” from Ohio seeking a place of racial acceptance in the the land of California. It was only here in California, arriving as a young adult, that I first heard of Executive Order 9066 and the internment of the Japanese American community. It was never part of my public education in Ohio, but living in the rust belt-I could palpably feel the anti-Japanese sentiment in the 1980’s around trade and the Japanese car industry. I experienced the shared fate we have as Asian Americans, when racism targeted at Japanese would be scattershot to all who have an Asian face. As a Chinese American, my family was impacted by the Chinese ban (80 years of Chinese Exclusion Laws). My grandfather, not wanting to risk getting stuck in Angel Island Detention Center or getting deported, kept going and ended up an immigrant in Sinaloa, Mexico. After several decades in Mexico, where he was known as Jose Lee, he was deported back to China along with tens of thousands of Chinese Mexicans. I am the mother of 3 mixed-race (Chinese, African American, Japanese yonsei (4th generation) children who carry the spirit and experience of their grandmother, Bette Yoriko Kikuchi, from Vallejo who was detained at age 16 in horse stalls at the Tanforan Racetrack and then later at the internment camp in Gila River, Arizona. She was fortunate enough to be liberated before the end of the war through the program sponsored by the American Friends Service Committee which obtained early release for students to relocate to the midwest. But the reason I was invited to speak to you today is because I work with today’s immigrant and mixed status families. Our organization brings together faith communities across California to respond and advocate for those impacted by immigration policy and mass incarceration. We work with families like Raul Lopez, who after 2 years spent in immigration detention, will be coming home Tuesday. We work with new arrivals and the Central American Migrant Exodus. We build networks of sanctuary and support the leadership of Spanish speakers immigrants newcomers, asylum seekers and those formerly detained and incarcerated. Today I’d like to offer my thoughts on how the past that we commemorate today helps us understand what is happening in our country at this very moment. Friday’s declaration by President Trump of a national emergency to bypass Congress and invoke special powers to divert funds in the military budget to build a wall and further militarize border communities reminds us of the executive power invoked by President Franklin Delano Roosevelt to forcibly remove 120,000 Japanese Americans out of “military necessity.” The known falsehoods and lies told of the potential threats and dangers among the Japanese American population echo the falsehoods and lies of potential threat and danger spoken about migrants at the southern border. Then and now, the military and its massive budget is being deployed against racialized members of our community. We must consider not just the racial implications of this act, but also the economic implications, as military contractors and private prison industries stand clearly to gain. How have we come to accept as normal once again in our nation’s history the detention and incarceration of families that happened to the Nikkei in 10 internment camps and 10 Department of Justice camps. We know that families then and now are traumatized, terrorized and faced months and years of separation. The agreement reached by Congress on Friday which successfully averted a government shutdown, approves a 45,000 daily immigration detention bed count (an increase of 5000 over last year), in 200 facilities across the country. This includes families, men and women, children, transgender immigrants, lesbian and gay, fathers, and mothers. Last year, over 323,000 people were held in immigration detention, awaiting hearings, trials, deportation. In June of 2018, there were so many detainees that ICE began diverting thousands into federal prison. Many of those captured by ICE are breadwinners while their families and children struggle to stay housed and schooled and keep it together while they live with the unknown of whether or not they will see their parent again. Unequivocally, camps, prisons, detention centers are an inappropriate, inhumane and unnecessary response to human migration. Immigration detention and internment camps are just one small part of the US carceral state. We have the highest rates of incarceration in the world. Imprisoning 2 million people with women (who are mostly mothers) as the fastest growing population. Incarceration has grown not because of an increase in crime but because of public policies that have chosen to incarcerate, disrupt families and lock people away. The criminalization of migration and people of color is based on punishment, deprivation, fear and racism which turns first to lock people up and deprive them of their humanity rather than seek more creative and effective solutions. We must not accept this as normal or acceptable. Not unlike the deportations of Japanese Peruvians by the US to Japan for hostage exchange in WWII, we are in a period of deportation creating permanent exile and permanent separation of families. We deported a quarter of a million people in 2018 and each and every one has a story. This includes a record number of Cambodian Americans who came to this country as refugees when they were children. Asian and Black immigrants are seeing increasing rates of deportations. As in the case of the 442nd, the Japanese American military regiment during WWII who served while their families were incarcerated, today service in the US armed forces does not inherently protect you from deportation and in Tijuana there is an entire community of deported US military veterans. Today, as we recall what it means to become the enemy in WWII, let us see clearly the creation of the false enemy at the Southern Border. Migrants internationally have become the face of the enemy. The UN estimates that there are 258 million international migrants. If we put them all under one flag, they would be the 5th largest country in the world. Everywhere, with a vengeance, migrants are being demonized and seeing walls erected by the very countries that are perpetuating the horrific conditions from which they are fleeing. They are being shut out even while the reasons of forced migration such as war,violence, environmental displacement, climate change are not being addressed. In this country we are seeing the demonization of the Central American Migrant Exodus even though most are coming to seek asylum, a legal form of immigration under US and international law. Those who are coming from Honduras are what author Dana Frank calls “refugees of US foreign policy.” In this past decade following a 2009 coup in Honduras that the US supported, the US has given $100 million of military security aid to the government of Honduras which has only fueled violations of human rights by the Honduran military against land and human rights defenders, corruption at the highest levels of government with narco-traffickers , and widespread violence and impunity. Those fleeing are refugees of policies of extraction, mining agribusiness hydroelectric projects which have taken people’s lands, polluted their rivers and left them with no means of survival. Those who are working in the factories sewing our underwear, tshirts, or picking our bananas, find the work unbearable and unlivable to feed and support a family, as the parent companies like Chiquita, Haines, Gildan avoid paying even the local minimum wage. We are collectively punishing those who seek freedom and a “better life”, while rewarding international actors who are breaking laws to displace, poison, kill and create the conditions causing people to flee. We have created the conditions for the caravans. Over the past 10 years as we built up more walls and fences, making the journey more difficult and dangerous, the price one must pay to come safely- run by the underground economy, smugglers and the cartels has correspondingly gone up. It has become more dangerous and more expensive, which is why the only way people see being able to make the journey is to travel en masse. Criminalization is used to justify the creation of the enemy that is to be feared and seen as a threat. We have felonized the act of crossing the border to turn people into “others,” who are not part of the human family. This is why we can lock people in cages; bar them for life; tear apart their families, lose their children, and not value them as human beings. I’d like to quote something I have heard Nikkei Resisters say: “Never Again is Now.” Yes- It couldn’t be clearer. History is repeating itself. And the question is why? Have we not remembered hard enough? Do we not have the political power to stop what is happening. Do we not have the Moral and ethical clarity to see that though it is not happening to us this time, we are not free until all of us are free? To be a person of color in this country means you will be subjected at some point to exclusion, expulsion, incarceration. This is part of the history of this county as we know it, founded on the colonization, expulsion, and near genocide of indigenous peoples on this continent. In order to support the occupation and extraction of resources on this land, people from other countries have been brought here- some forcibly from Africa – others by labor contractors from Europe, Asia and Latin America, others forced to come because their lands have become unlivable because of war and extraction. We will be allowed in when they need us. We will be excluded, expelled and incarcerated when we are not needed. In the last century, Japanese laborers were allowed into this country because they were needed, especially because of the shortage of labor created by the Chinese Exclusion laws. The Japanese could work, but not own land. But as they became the most important racial minority in agriculture in the Western part of the United States before WWII, responsible for 40% of California’s vegetable crop, they became a threat, and it was not long before they were forcibly expelled from California and incarcerated, suffering unrecoverable economic losses. There is another meaning of Remembering. A Member can also mean the limbs of a body. Remembering – means putting the pieces of the body back together again. Making things whole. Re- Member means bringing people back into the membership of the body, putting the community back together and finding a bigger sense of who my family, our brothers and sisters. This is the work of bridging borders to expand our notion of who is our people, who is our community. I’d like to close by calling up a few people I’d like to “re-member” today and connect to this community here today. The Yuba Hunger Strikers: 40 immigrant detainees refused meals this whole week to assert their humanity and dignity, to demand that the jail officials respond to their basic requests for humane treatment. They were asking for medical treatment, time out of their cells instead of being caged 19 -23 hours a day, to be treated like human beings. Their courageous actions taken while imprisoned reminds me of the acts of resistance which took place by the Japanese American detainees during their time of confinement. Two moms: Lourdes and Dianeth: Both of these mothers and spouses have been prophetic and bold in fighting for the reunification of their families. Dianeth’s prayer and hard work and the community support and legal action has come to fruition and Tuesday, her husband Raul, will finally be released from Immigration prison after two years. Lourdes after winning her spouse’s release, is once again battling to keep her family together. The government has appealed the judges decision in her husband’s case and Wednesday morning we are asking the community to show up to make sure that Fernando does not get redetained. Don’t underestimate the power of small gestures. Showing up to court with people is one of those ways to let people know that they are not alone. I invite you to our monthly prayer vigil outside the SF ICE building on the 2nd Fridays of the month at 11:30 am. All those Currently in Detention: Those in detention who do not have a family member need Sponsors and Accompaniment teams in order for them to get out of detention or else they could be in indefinite detention. In San Francisco, March 13th- there will be a program, Rainbows Not Walls: A Forum Supporting Transgender Immigrants which will share more about how people can help get people eligible for release out of detention as quickly as possible. Each of you have a role to play. Then and now, we need people to pray and act and organize. We need people to fight to change unjust laws. We need people to dispel racist and bigoted myths. We need people who can offer material help; write letters and send books to those in detention. We need people to house people in rooms and congregations and to devise schemes to get people free.